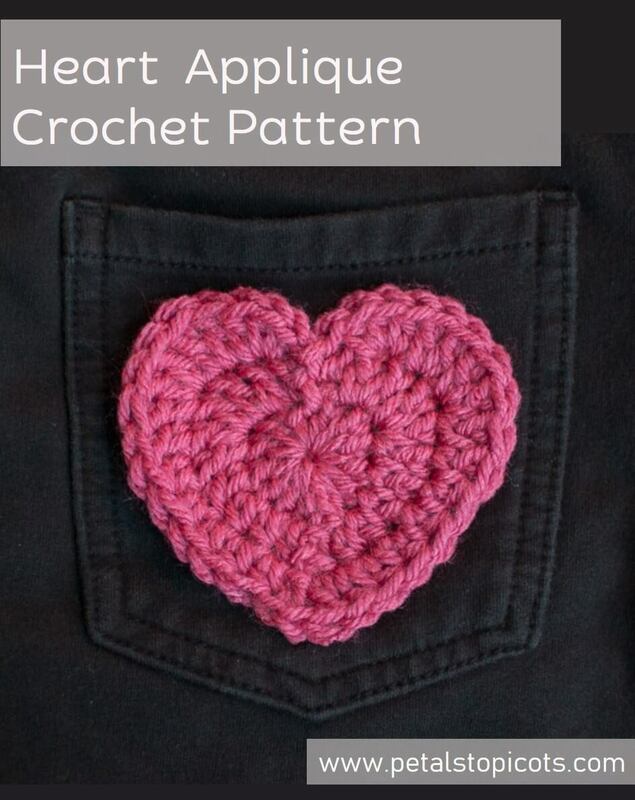 Home > Crochet > Free Crochet Patterns > Crochet Heart Applique Pattern … Perfect for Valentine’s Day! 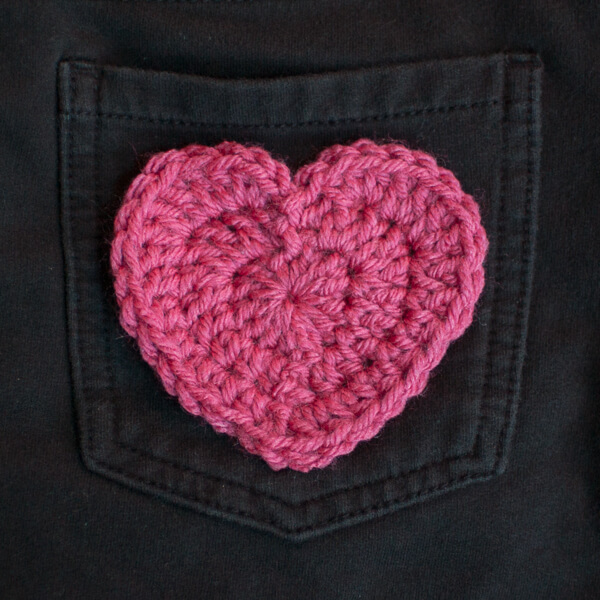 This crochet heart applique is perfect for embellishing anything from pockets, to headbands, to bags, to hats, and so much more … perfect for Valentine’s Day or anytime you need a little extra cuteness! The finished applique size as written below is approximately 3½ in. wide. You can find patterns for more crochet heart sizes here. Note: Chains are not counted in end of round stitch counts unless otherwise noted in parentheses. Finished size is approx. 3½ in. Round 1: Ch 3 (counts as dc), working into the ring, work 3 hdc, 3 dc, ch1, Sl st in ring, ch 1, continue working in ring 3 dc, 3 hdc, join and pull tail of yarn to close up ring — 14 sts. Round 2: Ch 3 (counts as dc), 1 hdc in each of the next 3 sts, 1 dc in next, 3 dc in next, 2 dc in next, ch 2, Sl st in Sl st from previous round, ch 2, 2 dc in next st, 3 dc in next, 1 dc in next, 1 hdc in each of the next 3 sts, join — 20 sts. Round 3: Ch 3 (counts as dc), 1 dc in same st as join, 1 hdc in each of the next 5 sts, 1 dc in next, 3 dc in next, 2 dc in next, 3 hdc in next, ch 1, Sl st in Sl st from previous round, ch 1, 3 hdc in next, 2 dc in next st, 3 dc in next, 1 dc in next, 1 hdc in each of the next 5 sts, join — 31 sts. Use a needle and thread to stitch it in place, or for a more temporary embellishment, use a few strips of double sided garment tape. Click here for more free Valentine’s Day crochet patterns. I am going to give this a try, I even have some nice red yarn to use for this. Been wanting to try some new crochet patterns and this one looks easy to make. In your instructions, you say to join, to what stitch do I join at the ends of these rounds? Am I the only one who doesn’t know where to join? No, you’re not the only one! I’d like to know, too! If I want to make it larger would I just continue following this pattern till I reach size I want? Essentially yes, but it might take some tweaking around the increases on the upper parts. Hello! If one wanted to increase the pattern and make more rows to make a larger heart, how would this be done? How cute is this!! I love this one and also the heart wreath! I’d like to include a link to your website and one photo of each project in a Valentines Day crochet pattern roundup if that’s alright with you. It will be posted later this week on candleinthenight.com. Thanks so much! So glad you like them! Yes, that would be wonderful … thank you!! For round 2 i keep coming up with 19 sts i stead of 20 sts…why?? Are you counting the beginning ch 3 as a stitch? So cute! How many stitches do you do in the magic ring to start? Hi Erica 🙂 Just start in with the instructions for Round 1. What a sweet little heart! Thanks for sharing.